If you are running complex workloads on AWS and managing large groups of instances, chances are you are using some form of configuration management. Configuration management tools are effective in automating the deployment and configuration of applications on hybrid instances. However, efficiently managing the distribution and execution of the playbooks or recipes, centrally managing the code, having a secure and scalable deployment mechanism and properly logging system changes is a challenge. To address this, some of our customers use tools like cron, Rundeck or others provided by configuration management vendors. In this blog post, I will show you how to execute configuration management directives using Ansible on your instances using State Manager and Run Command, and the new “AWS-RunAnsiblePlaybook” public document. This document runs Ansible locally on your instances. For Amazon Linux Ansible can be installed using pip. You can use the following command. For Ubuntu you can install Ansible using the default package manager. Use this command. Let’s walk through the process of using State Manager to set the desired state for an instance using Ansible Playbook. To understand better how you can use this new public document with State Manager, let’s imagine you have a fleet of servers running Apache. You want to make sure that the web server software is installed and running all the time. From the EC2 section of the AWS Console, select “State Manager” from the “System Manager Services” section of the left pane menu, and click on “Create Association”. Select the “AWS-RunAnsiblePlaybook” document, your target instances (or tag) and the application schedule. In the Parameters section, since the playbook will be specified as direct YAML text, let’s just paste it on the Playbook field and leave the Playbookurl field empty. In the Extravars field, we can enter any additional variables we would like to pass to the playbook for execution. In this case we are not using any additional variables, so we take the default. Select if you want to use the Check option. After you click the “Run” button, the console will display the Association ID of this run, which you can to see the result and verify the output from the console. After the association runs for the first time, you can see the results of the execution by navigating to the association and looking at the status column. Now every time the association runs it will run the playbook and this in turn will ensure the software is installed and running. Run Command lets you rate control remote execution by configuring maximum number of concurrent invocations and errors allowed. This feature will set a threshold to detect errors and stop the execution if the threshold is passed. 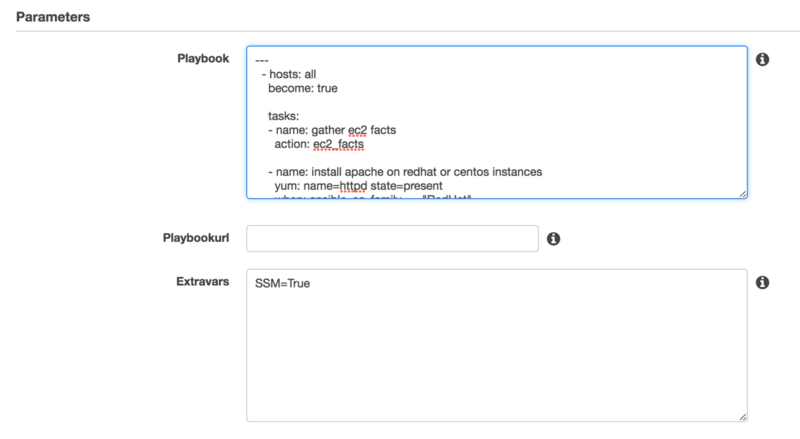 In this post, we’ve showed you how to use State Manager and Run Command to deploy Ansible playbooks at scale. These tools are secure, easy to use platforms that let you perform remote administration and maintain state of your hybrid instances. You can control the rate at which you send commands, use fine-grained permissions, and use notifications to simplify your workflow. Andres Silva is a Senior Technical Account Manager for AWS Enterprise Support. He has been working with AWS technology for more than 6 years. 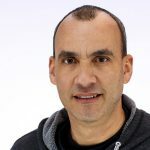 Andres works with Enterprise customers to design, implement and support complex cloud infrastructures. When he is not building cloud automation he enjoys skateboarding with his 2 kids.